This is a very easy but powerful kit to use. Hand crafted, one at a time by myself exclusively, this Voodoo Candle Magic Kit it receives the same personal attention and concentration which I give to all of my excellent products. It is designed to effect quick positive changes without having to begin a lengthy or complicated ritual. It is based upon the very ancient art of CANDLE MAGIC, using the authentic formulas and powerful spells that have been in use throughout the world for thousands of years by Gypsies, Voodoo doctors, Shamen and Curanderas. 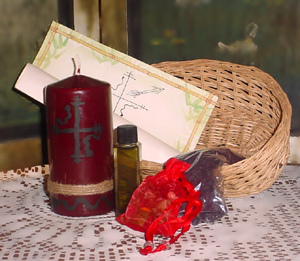 Each La Sirena Voodoo Candle Magic Kit includes specially prepared and anointed candle(s), a packet of specially blended and formulated incense, an anointed gris-gris, plus a vial of aromagick oil specially blended for your purpose and the exact prayer or incantation needed to realize your own magic spell. These are the very same prayers and chants which I use myself in my temple room or in Nature to serve the Spirits. As always, this product from La Sirena Botanica is entirely prepared by hand and by myself and is consecreated on the Altars before shipping to you. So you know you are getting a powerful and authentic product crafted with your success in mind. This Voodoo Candle Magic Kit is a great tool to use when you have only a short time to devote to spiritual work but have a great need for some positive change to take place, or to use as a reminder and refresher of your devotion in between more elaborate rituals. This is a perfect way to renew yourself and your goals . It will help you with defining your goals and purpose and to achieve your aims. We do advise a reading/consultation if you have several goals intertwined, a serious or complicated situation or do not know which spell you wish to cast for yourself. Each Kit contains: Anointed candles + Specially formulated and blended self-igniting incense powder + blessed and anointed gris-gris bag + a vial of La Sirena Aromagick Oil + My personal Prayer or Incantation on parchment paper. In a decorative basket.